Three recently digitized manuscripts from one National Zoo employee, provides some new behind-the-scenes insights. Did you know that the first beaver came to the National Zoological Park in 1894? 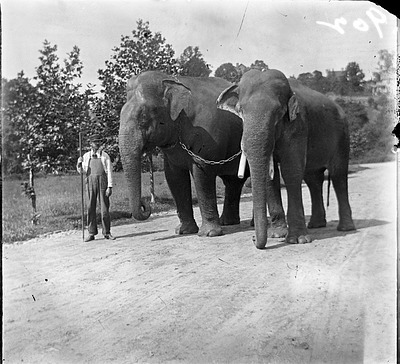 Or that the first animals on the official zoo grounds were two Indian Elephants, Dunk and Gold Dust? Surely, you knew that the Dusit Zoo in Bangkok donated an albino Asiatic turtle to the National Zoo in 1966? You didn’t know that? Well, thanks to the work of Sybil Hamlet in 1985, you can now learn all of these facts and more! Sybil Hamlet was the Public Information Officer at the National Zoo for over twenty years. As part of her job, Hamlet was responsible for gathering information about the history of the Zoo, including animal births, deaths, and acquisitions, as well as the construction timeline for various building projects around the Zoo grounds. In 1978, Hamlet began work on a manuscript of the history of the National Zoo from its inception to 1973, including a written chronology of events. Although the manuscript and chronology were never formally published, three drafts of the manuscript exist within the collections of the Smithsonian Institution Archives in Record Unit 365 National Zoological Park. Office of Public Affairs Records, 1899-1988 and undated. We recently digitized and published one of the drafts online, along with Sybil Hamlet’s chronology of major events from 1887 to 1972, and now you can discover interesting new facts about the National Zoo! National Zoological Park, Office of Public Affairs, Subject Files, circa 1982-2002, Accession 07-053. William M. Mann and Lucile Quarry Mann Papers, circa 1885-1981, Record Unit 7293.